Honor your loved ones and personal Coast Guard heroes with this patriotic American flag display case. This case is made with a wide based sturdy frame and crystal clear glass, made complete at the bottom with the shining United States Coast Guard emblem. 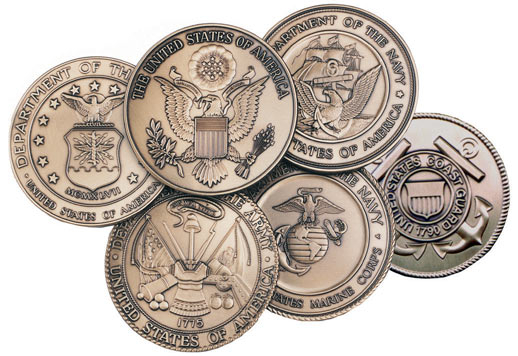 Perfect for proudly displaying your cherished loved one's honor and sacrifice. Display and protect your cherished American flag in this handsome mahogany colored hardwood flag case. A die-cast, gold-plated, 2” wide United States Coast Guard medallion is centered on a bevel-cut, double blue and gold mat. The case is 18 ¾” on the sides, 13” tall, and 26 ½” across the bottom. The outside of the case is 3 ½” deep and the glass front is set ½” inside the edge. The flag case features an easy open back panel and felt lined, scratch resistant bottom. The case will accommodate flags up to 9’ ½” x 5’. Coast Guard Flag Display is constructed of rich mahogany colored hardwood and a thick, glass insert. This display case comes complete with the officially sized 5-feet by 9-1/2-feet U.S. flag. Made from cotton with embroidered stars, this is the same flag used by the VA and meets all official government regulations. A die-cast U.S. Coast Guard medallion is elegantly centered in the middle of this case. The back is designed with an easy open panel. 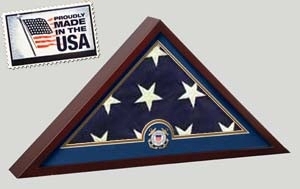 The flag display case also features a felt lined, scratch resistant bottom. Outside dimensions are 26-Inch by 13-Inch by 3-1/2-Inch. The U.S. Flag-feets dimensions are 5-feet by 9-1/2-feet.